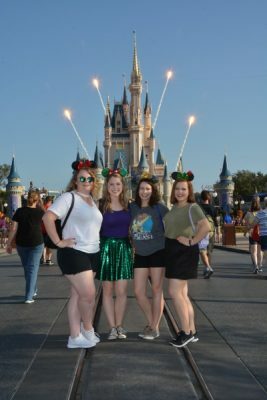 Planning a Friends Trip to Walt Disney World - Tips and Tricks! There is nothing like a trip with your closest friends! You are getting away and having the time of your lives together on new adventures. Pair this with a friend’s trip to Walt Disney World, and you have pure happiness! Before the friend’s trip can happen, however, planning is inevitable! Where will you stay? Where will you eat? What FastPasses will you snag? It can seem a bit overwhelming at first, but if you plan together, it can come together in a cinch! Here are some tips and budgeting ideas for planning a friend’s trip. Discussion time! Make sure all of you get together to discuss details. Who will be the one who makes the reservation and uses their card for any dinner reservations you might make? When the time comes for making FastPasses, who will make them? Are you going to get matching shirts? Shoes? Mouse Ears? It is important to discuss what you all would like to do as a group together and what is most important for you all to do. Throw out suggestions and listen to what everyone else has to say too. Just bounce ideas off of one another! When having this conversation, remember that Disney trip planning is one of the best things in the world, so don’t forget to have fun with it! One of the first things that usually comes up in a trip planning conversation is, where will you all stay? Now Walt Disney World has numerous resorts to stay at, that is for sure. 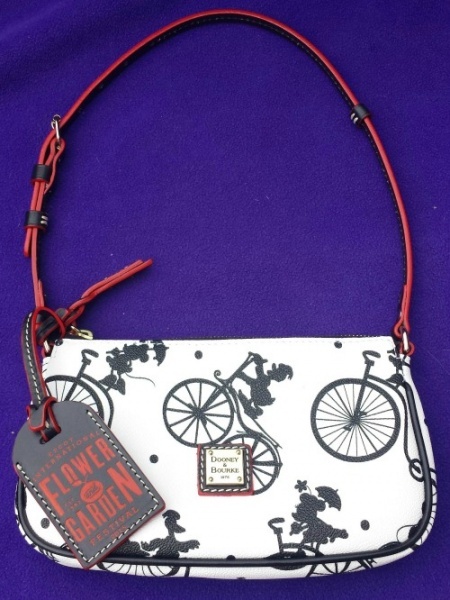 They come in a variety of price ranges as well. Your group should discuss the budget and look at some of the resorts in that budget. You might think you are getting less on a tight budget, but let me say this. Any resort you stay at on property is magical and offers a wide variety of amenities, so just because you choose to stay at a value resort does not mean you are receiving less. In fact, my personal preference is to stay at the value resorts, such as Disney’s All-Star-Resorts (All-Star-Movies, All-Star-Music, and All-Star-Sports) and Pop Century. We stayed in Disney’s All-Star-Sports Resort, and we had an absolute blast when we spent time there! The atmosphere at all value resorts are so fun, and so beautiful the way they are all themed! Their food courts are delicious serving a variety of dishes for breakfast, lunch, and dinner. Also, while resorts can be very fun to explore and eat at, remember it is a place to sleep on your vacation. So definitely stay at a place to your liking, but remember that during the day, you most likely will be out having adventures! If you live fairly close to Walt Disney World, then you will probably just drive in for the day, weekend, week, or however long you plan to stay. This, of course, makes sense. However, if possible, I recommend flying as the best choice of travel to Walt Disney World. You are probably sitting there, going, “duh, of course,” but let me explain. While driving does provide you traveling at your pace and ability to drive to some of the parks yourself, arriving at the Orlando International Airport can be so fun knowing that you will soon be in Disney. Also, bonus, it keeps you from having to pay for parking. Not only are you so excited, but it is so insanely easy to get from the airport to your resort by Disney’s Magical Express. All you do is scan your MagicBand, board the bus, and you’re on your way! And, it’s FREE. When making your reservation, mention that you want to use Disney’s Magical Express, and the Cast Member will direct you where you need to go. It’s that easy! When you’re in Walt Disney World, you never need to worry about transportation, because everything is taken care of for you. There are buses running to all the parks around the clock, there’s the monorail, the ferry at the Transportation and Ticket Center, and the new Minnie Van service! No need to worry, you will get where you need to go easily and in no time! There is no end when it comes to dining options at Walt Disney World. Whatever you all are feeling, you’ve got a variety of choices, in different budget ranges. Not every meal needs to be planned down to the wire. 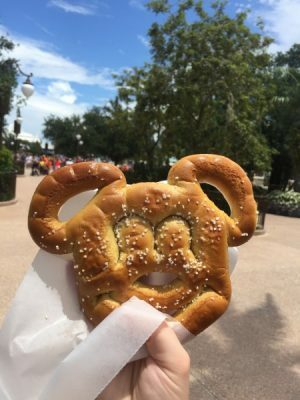 Walking around the parks, you may feel like you would rather have a Mickey shaped pretzel, a cupcake, and popcorn rather than a full sit down meal. Not having meals planned is fun too, but things can add up quickly as well. Something my girls and I did was split a meal between two of us. Usually Disney meals are huge, so they can be split between two people, whether it be quick service or sit down dining. For table service meals, there are nice places that will definitely not break the bank. Discuss if anyone has any specific dietary needs and check out the menus of the restaurants your thinking before making a reservation. If you want it, Disney Springs has it! It is the place to go for a night out on the town with your girls. Disney Springs has recently been expanded and refurbished, and there is more there to do now then ever! Once the parks close, or you are having a down day at Disney, you can head on over to Disney Springs for some extreme shopping and exquisite dining! 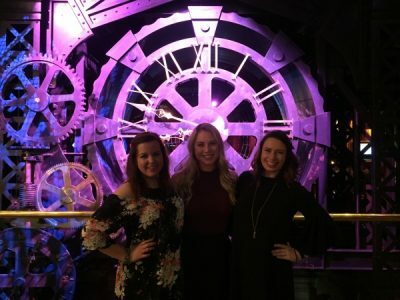 One of my new favorite places to eat are The Edison, a new steampunk/speakeasy atmosphere where the food is absolutely divine. We loved it there! My favorite store is the World of Disney, which is newly refurbished. However, Disney Springs also has different activities if you aren’t feeling the shopping and dining scene. There is Splitsville, a luxury bowling experience. At $22 a person, with additional pricing for delicious dining and drinks, you can enter a little friendly competition with your buddies! If you are looking for something totally different (and epic!) check out The Void. The Void: Secrets of the Empire, is a new virtual reality experience in the Star Wars Universe. At $35 per person, the adventure lasts a long time, and afterwards, you are still on cloud nine from your mission..it’s awesome. And, as of November 21, 2018, Wreck-It-Ralph has joined The Void, and you can join him in breaking the internet! One of the best decisions my friends and I made on our Disney trip was deciding to purchase Memory Maker. 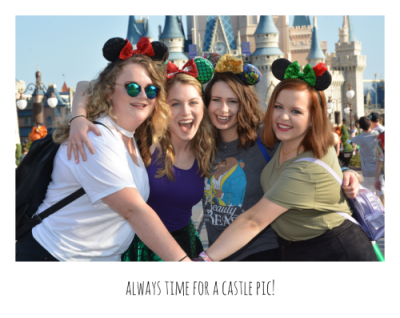 We got any PhotoPass photos we wanted without any additional payment, and it was so easy for us to download the photos to save them for future enjoyment! Anywhere you get a PhotoPass photo, it will immediately be uploaded to your account on the My Disney Experience app, and you can view them right away! After your trip, you can download them or order them without any additional cost. When you go to order them, you have the option of adding frames, animations, and other special effects to your photos if you wish. All of your pictures are taken care of for one price, and it is amazing! A Walt Disney World trip does not come without its hustle and bustle. There are so many amazing things to do, you want to do your best to do as much as possible! However, it is important to enjoy the little things. These little things might possibly be some of the most magical parts of your trip, therefore making some of the best memories. Enjoy coffee on the hub grass with Cinderella Castle in view. Search for hidden Mickeys. Take too many pictures in your matching shirts. Visit all the princesses. Enjoy a Mickey-shaped cake pop while watching Happily Ever After. Take the time and savor every single little thing, soaking in all the magic! What tips do you have for visiting Walt Disney World on a friend’s trip? Let us know in the comments, or on Facebook or Twitter! I LOVE this article!! Lots of great suggestions.